You think you know clowning…? Fear & Love & Clowns is the first production from Fear & Love, a group of five soon-to-be graduate actors from the Victorian College of the Arts. Using clowning at its most fundamental level, we follow the story of four clowns who find themselves embroiled in a villainous plot. There is a nice blend of slapstick and pantomine in this show: the characters bumble and stumble and fall, and sometimes the humour does get a little crass. However, there is great heart to the story which is told mainly through mime. The five actors – Alistair Frearson, Chelsea Zeller, Emil Freund, Tristsan Barr and Michael Gosden – successfully develop the narrative through animated and dynamic movement, gestures and facial expressions. Furthermore, the performers display a high level of character physicality and give great individuality to their roles. 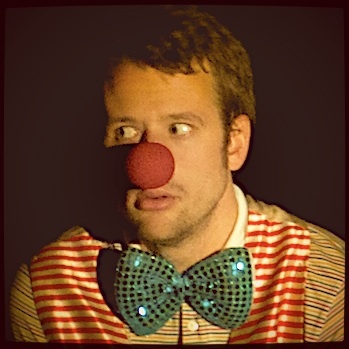 Personally, I found Frearson to be quite exceptional in his clowning persona, as was Freund as the ‘straight’ clown. Frearson was also particularly strong as the villain of the piece, and really did create some genuinely tense moments with his evil doings. Fear&Love&Clowns has solid direction, and a great production team behind it with Jackson Trickett on lighting and Bart Welch on sound with the latter’s vocal effects adding much to the show. On a performance level, whilst the energy generally remained high, it did waver occasionally with a few flat moments here and there. The cast and crew have done their best to keep the action short and pumping, but perhaps these moments still need addressing. Venue: Tower Theatre, The Malthouse, 113 Sturt St, Southbank. MICF: What Would Bill Murray Do?